> It’s that time of year again. The fresh faces of new students beginning their college life and the return of seasoned upperclassmen and women have started to appear on Syracuse University campus, with classes starting on Monday, August 31. SARO is gearing up for the new school year with our semester kick-off meeting scheduled for Thursday, September 10th at 7pm on SU campus. The meeting will be in room 101 in the Hall of Languages. If you have any interest in helping animals in the Central New York, check your calendar, save the date, and join us at the meeting. This year SARO wants to help you have a cruelty-free Thanksgiving. 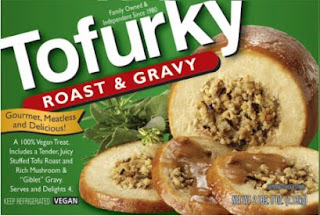 In keeping with that idea SARO will be raffling off a Tofurky Roast and Gravy pack for you to enjoy for Thanksgiving. Raffle tickets are $2.00 each and can be purchased at any SARO event beginning September 5th. The raffle will be drawn on Monday, November 2nd at the end of our Healthy Monday event. We will also be taking preorders, for Earth’s Own Natural Market & Cafe, for Tofurky Roasts so that you will not miss out on having one of these mouthwatering babies on your Thanksgiving table. This entry was posted in meetings, raffle, syracuse university, thanksgiving, tofurky on August 27, 2009 by saro.